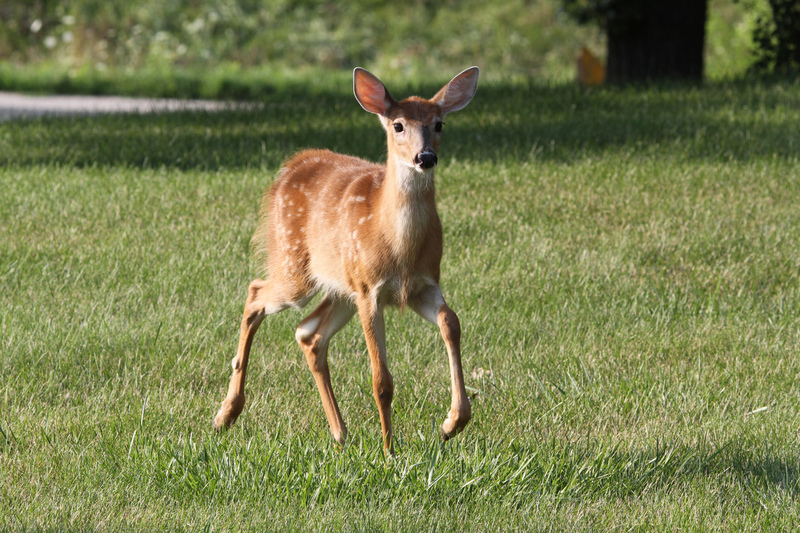 This fawn was in our backyard yesterday. The lens I typically have attached to my camera for spontaneous shoots is my 24-105mm lens. 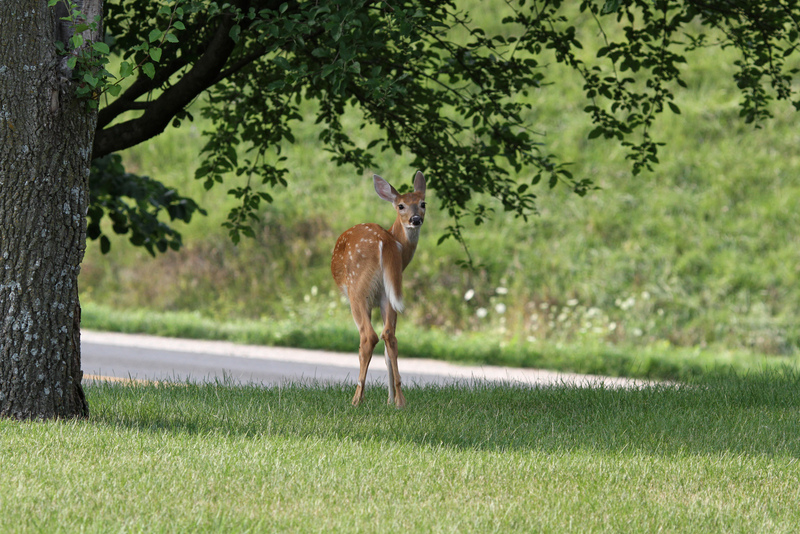 How lucky I was yesterday, when Bill told me to hurry outside to see this fawn, that I already had my 135mm lens with 1.4x extender attached, ready to go. I think I wish the wildflowers (in the first photo) in the background were a little more in focus. Or, maybe not. 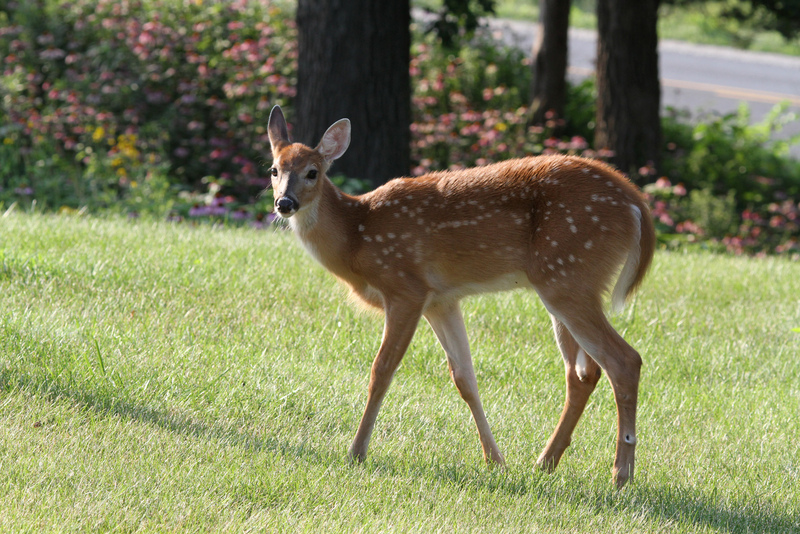 Either way, I love the combination of Bill’s wildflowers and this fawn. In the second photo I like the close-up detail of the fawn’s “eyelashes.” Clicking on any of the images will magnify the detail. None of these images have been cropped. 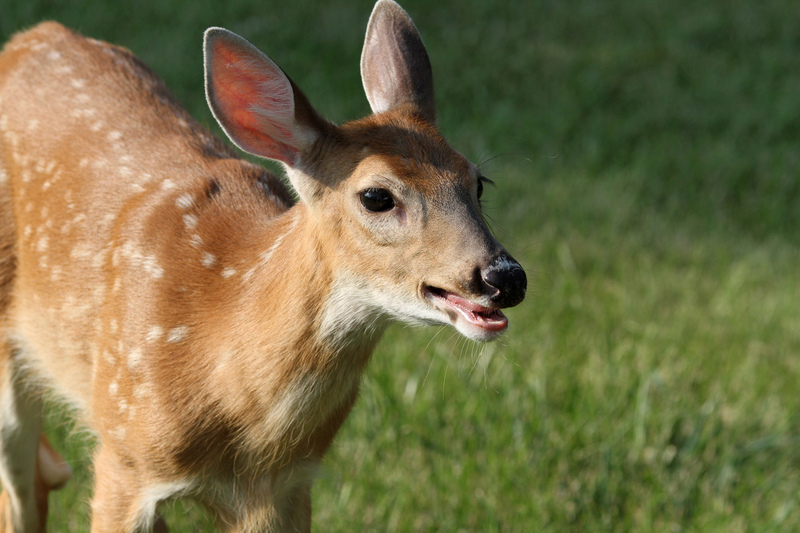 In the first thumbnail (below) I think the fawn is trying to use its tongue to get rid of a fly. 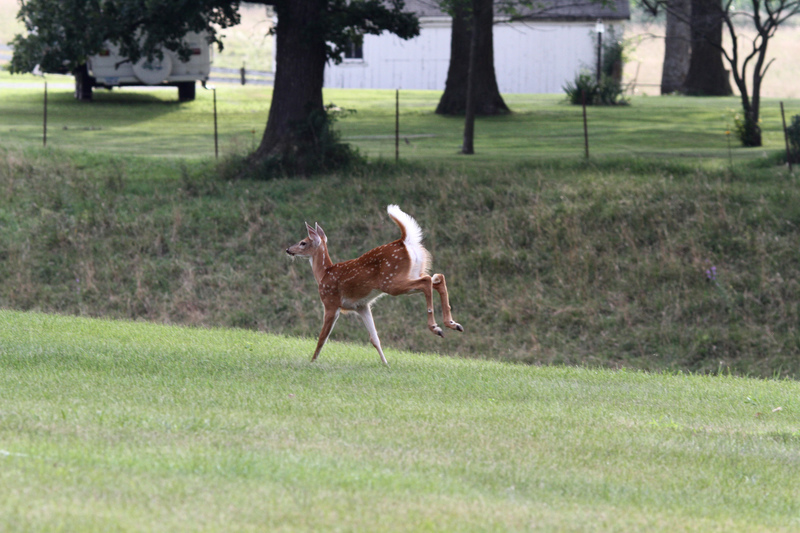 The fawn is to the west of our house when it is running away and has its hind legs in the air (below). The neighbor across the road had just hollered a “Hi, Bill!” without knowing I was taking photos. 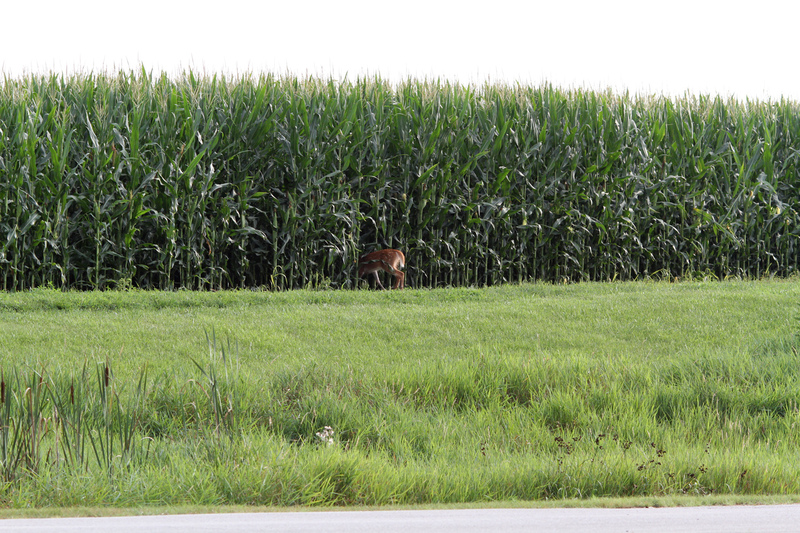 The fawn was startled and ran into the cornfield (in the last thumbnail) which is to the southwest of our home. This is the same cornfield I posted about on May 18, 2011, and June 29, 2011. Next up (unless something seems more pressing): Mother’s 1949 watercolors and the 1948-49 Rolfe school yearbook. This entry was posted on July 25, 2011 at 1:15 pm and is filed under Uncategorized. You can follow any responses to this entry through the RSS 2.0 feed. You can skip to the end and leave a response. Pinging is currently not allowed. And, yes! Exactly what Nancy said! Happy for you (and for us :-))! 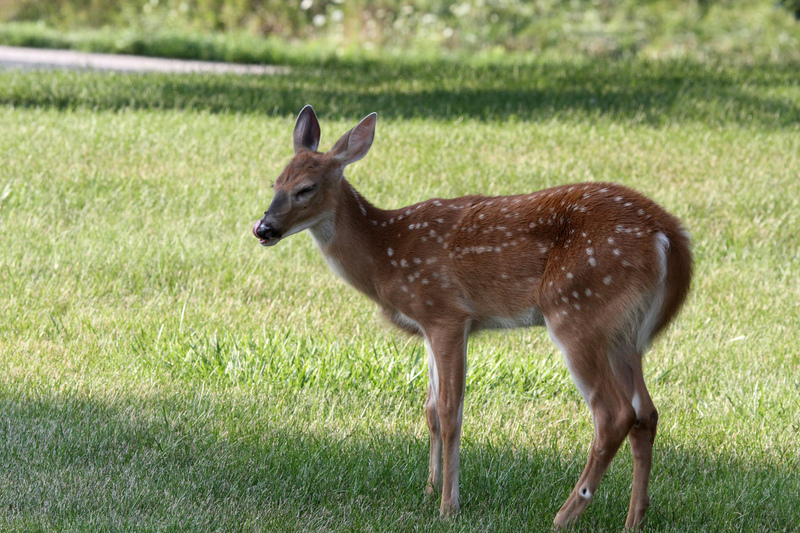 Nancy, Peg and Glenn: I’m glad you like the photos of the fawn. You know, Nancy, I like the one of the fawn looking over its shoulder, too. It’s giving me some attention! What a little cutie Love all the details and lighting..